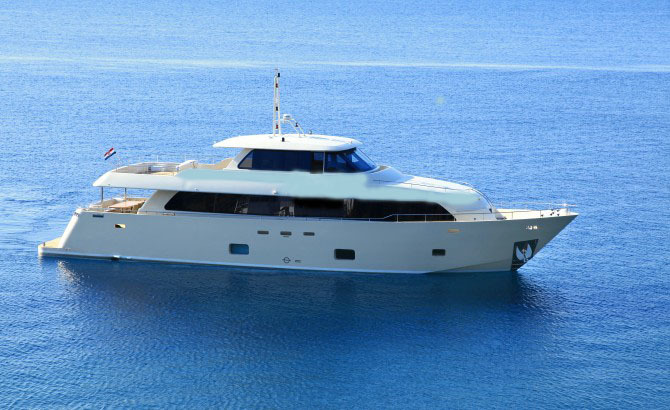 The motor yacht built in 2013 is in excellent condition and in 2018 is for the first time available for charter with a great price on the market. The Yacht can accommodate up to 10 guests in her 5 stunning designed cabins all with ensuite facilities. The main salon offers a large fantastic sitting area which faces a flat-screen TV and has plenty of natural light due to the panoramic windows with a formal dining table which can seat up to 10 guests for a perfect meal with a beautiful view. The Master cabin with en-suite facilities is located on the main deck with a walk-in closet, on the lower deck are located two double cabins and two twin cabins all with large closets and en-suite facilities, TV/Media room located close to the captain’s command bridge, featuring a flat TV screen. The yacht has respectful water equipment, peaceful flybridge, lovely al fresco dining area in the aft and an impressive teak swimming platform where you can relax and enjoy the sensational island panorama of Croatia or Montenegro. The yacht hospitality is provided by 4 professional crew members consisting of a captain, a chef, a hostess and a deckhand, who are all at the guest’s disposal according to the wishes and needs. If you charter this exclusive motor yacht you have the decision about privacy, entertainment, sport, recovery and adventures. In short, you are your own tour-operator.